Altu&#039;s Ethiopian Cuisine | Where Is Altu’s? 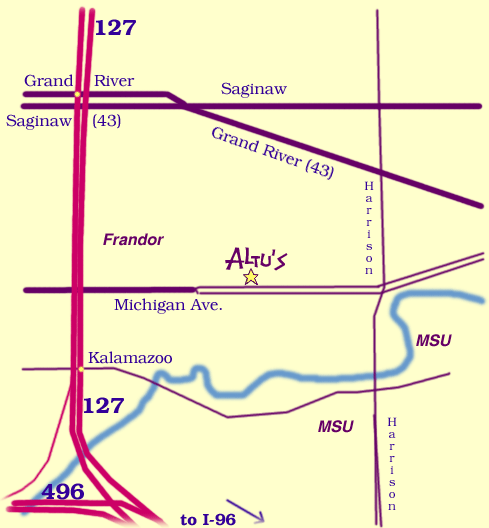 Altu’s is conveniently located just a few blocks east of Frandor, on Michigan Avenue in East Lansing. We are several blocks east of Frandor. From the East, take Michigan Avenue West. The last major intersection is Harrison. Altu’s is at the end of many blocks of homes, on the right-hand side. The restaurant is in the last building in East Lansing. Turn into the parking lot just before the Lansing City Limits sign. We are in the same building with Studio de Danse, whose sign you may notice first. From the South, take 127 North and exit at the Kalamazoo/Michigan Avenue exit. Go straight through the first light (Kalamazoo). Turn right at the next light (Michigan). Watch on the left hand side for a large empty lot (which formerly held the dance bar called The Dollar). We are the next building past that lot, a bit off the road. There is a boulevard at that point, so go past Altu’s until you can turn left with a U-turn to cross the street. From the West, take 496 East to 127 North and follow the above directions for those from the South. 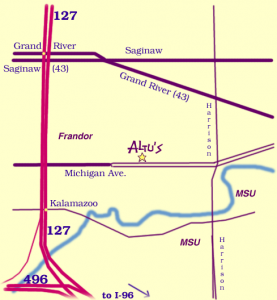 From the North, take 127 South to the Saginaw/Grand River exit. Keep going straight, past Saginaw/Grand River and past a neighborhood on a service road just right of the highway. The second set of lights is Michigan Avenue, where you will turn Left. Watch on the left hand side for a large empty lot (which formerly held the dance bar called The Dollar). There is a boulevard at that point, so go past Altus until you can turn left with a U-turn to cross the street. Altu’s is open Tuesday through Saturday, 11am to 2:30pm and 4:30pm to 9pm. We are closed Sundays and Mondays.